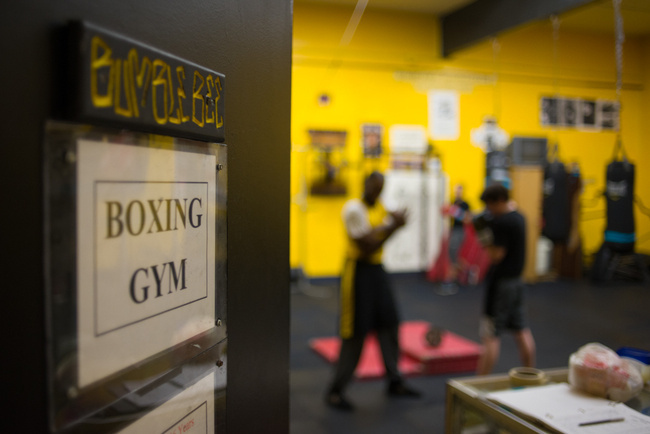 Anyone who knows anything about boxing in Seattle will have heard of the Bumblebee Boxing Club. The folklore associated with its regime has made it into an icon of the city, and I’m proud to say it’s also the site where I started my own journey as a pugilist before setting out into the world capturing fight stories. Located in the back room of a building owned by the Union Gospel Mission, a non-profit organization aimed at serving the homeless and underprivileged communities, the gym opens its doors as the Mission closes theirs. Truth be told, I never really knew what the Mission was considered officially. I didn’t know if it was a church, a social services program, or a community center. I just knew they took care of people. I walk down the hall and hear the sounds of sweat—the swaying chains above the heavy bag, the smacks of leather upon leather, the repetitious whip of a rope skipping against a matted floor. I look on the sign posted on the door before I open it: “This is a safe zone. All are welcome here.” I smile at its continued presence and turn the doorknob. The heat of the room fogs my glasses as I stepped in. List of gym rules posted at the Bumblebee Boxing Club in Seattle, WA. Violations of these rules result in penalties paid by push-ups. “Nasty Nick Wong!” someone yells out immediately, using my ring name back when I used to compete. The voice belongs to Willie Briscoeray, better known as Coach Bumblebee and the head coach of the gym. 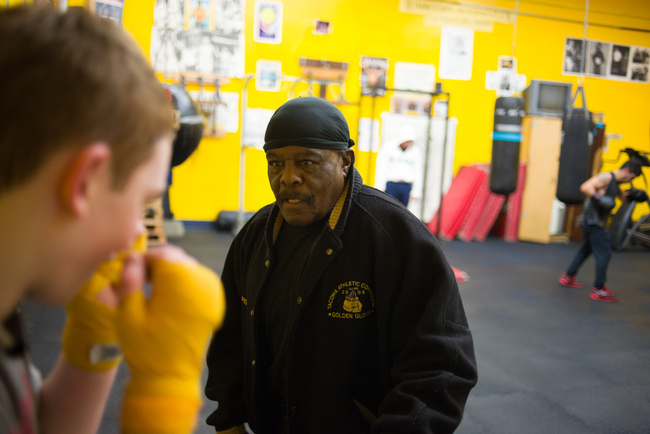 A stocky 67-year old with gold teeth and a trademark smile, Bumblebee is a Seattle legend in his own regard, and holds an impressive pro and amateur career under the tutelage of the world-renowned Eddie Futch. Bumblebee waddles over and gives me the signature “Bumblebee Handshake” and a firm hug. It’s been a good year since I stepped foot inside this place, but he greets me like he had just seen me yesterday. The club has been around for 23 years, conceived when the Mission first opened its doors in search for an after-school programs for the youth in the neighborhood. When Bumblebee approached them with his proposal to open a boxing gym, they merely responded, “We’ve been waiting for you.” After a few laughs, I asked him why he thought they responded in that manner. Coach Bumblebee observing a fighter’s stance during training. Discipline is probably the one word to describe the gym. 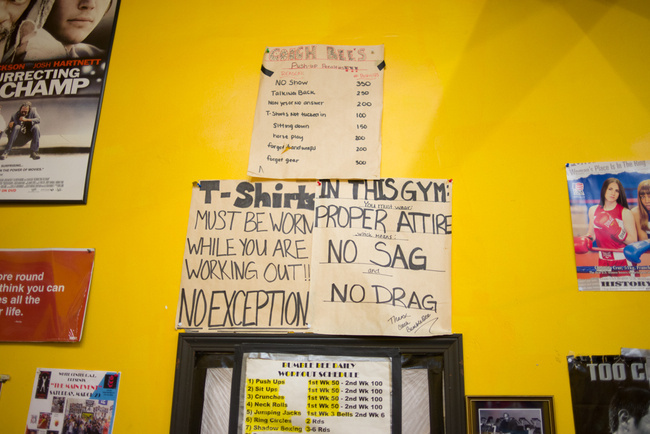 Posted high on the wall near the door is a hand-scribed list of rules that when broken are paid in push-ups, things like forgetting your gear, sagging your pants, and responding to questions in something other than “Yes Coach” or “No Coach”. Younger fighters are still required to show their report cards in order to continue training, nobody is allowed a bathroom break without asking permission, and if anyone’s mother calls in reporting “back-talk”, the consequences are dire. The gym is old school, meaning its formula to cultivating good fighters is a simple one: hard work and discipline. What it lacks in modern-day fight technology, it makes up for in sweat and grit. Most workouts involve using bodyweight and gravity, and finishing the daily regime takes the entire three hours the gym is open. Heavy bags are revived with duct tape and the sparring ring is a small 8x8 padded square in the back fenced off by ropes made out of garden hoses. It went up when the gym first started and has remained ever since. Fighter Manuel Dunham helps a teammate lace up before a sparring session. Dunham boasts an impressive 56-14 amateur record and once a #6 ranking amongst all amateur fighters in the nation. 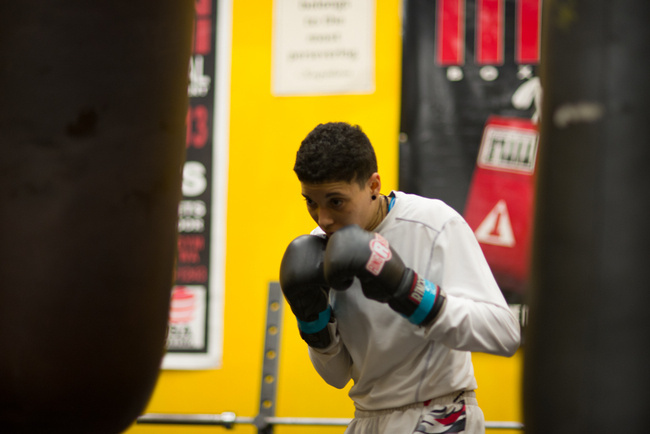 The three-time Pacific Northwest Champion and Golden Gloves winner is looking to go pro early next year and keeps busy by training and helping out around the gym by looking after the younger fighters. He works night shifts as a security guard and is also an active church preacher on Sundays. Having moved from Alaska to pursue his fighting career in a city with no friends or family, Dunham found difficulty in balancing the demands of being a full-time fighter and the logistics of living, so Bumblebee took him in by letting Dunham stay in a spare room of the house. Despite the hard-knock structure of the gym, the core of it all is gentle. Fighters gather around to receive advice from Coach Bumblebee during a training session. If I had to choose another word to describe the gym, it would be ‘family’, with of course Bumblebee sitting at the head of the table. He was probably the first positive male figure in my life that got through to me. Beyond instilling a ridiculous amount of self-discipline, he just had good things to say about living. Things like, “Don’t go after a girl that already has a man,” or “Treat everyone with respect”, were things that stuck with me. He taught me how to shave at my first tournament and when I was, according to him, “robbed” of my first fight, he was irate in a way as if something had been taken of his own kin. And he treats everyone in the gym this way, like they mattered, like they were part of a family. He’s had a lot of students to look after (by his account over 2,000 kids have gone through that gym), but he always managed to give just the right amount of advice to set you straight, and before long, you’d find yourself echoing the same words onto those that came after you. Essentially, he made us all better people. There have been all walks of life training at the gym, from police officers to ex-convicts to college students and the working class. The gym is a melting pot of sorts—race, class and gender all gets washed away when the bell rings; all that really matters is how well you train. And while like in any family there might be the small hang-ups every so often, family is family in the end, and that concept of accepting everyone as they are, rings true. Randy Gomez, a former Golden Gloves champion and one of the gym’s only professional fighters, attests to that personally. 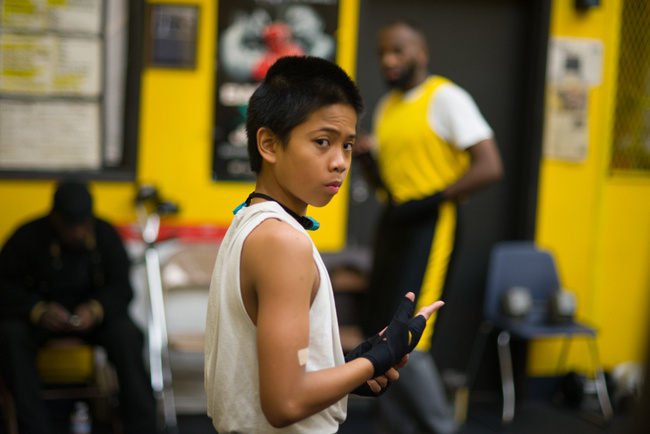 Young fighter wrapping his hands before his training session. That belief is something I’ve always remembered about Bumblebee. No matter how outlandish the idea, he really thought you could do it, as long as you worked at it. I’d say that was one of the most essential elements that made the gym so strong; there was a real sense of belief that we were capable of being our best selves. Not everyone made it out of the gym a decorated champion or even with a winning record (though most did), but we came out better people, and when we were smart enough to recognize the important things in life, we’d see where all that hard work had gone. A number of accomplished pugilists have called this place home. Names like the amateur phenom Buddy Tyson and Walter Wright, one of the stars on the first season of “The Contender”, both hold roots at the club. Probably the most notable fighter is Bumblebee’s own grandson David Jackson who was on the 2000 Olympic squad, but lost on the scales in the 2nd round when he couldn’t make the 132lb limit. Afterwards, Jackson strung up an impressive 9-1 professional record, but hasn’t been seen around the sport since 2006. Rumor is that he’s gone back and forth on a battle with depression, and does his best to keep his life together. 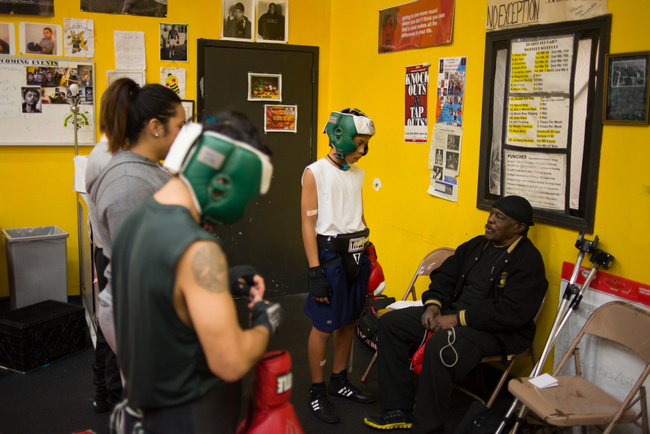 The legendary Coach Bumblebee watches his fighters during training. According to him, over 2000 members have walked through its doors. 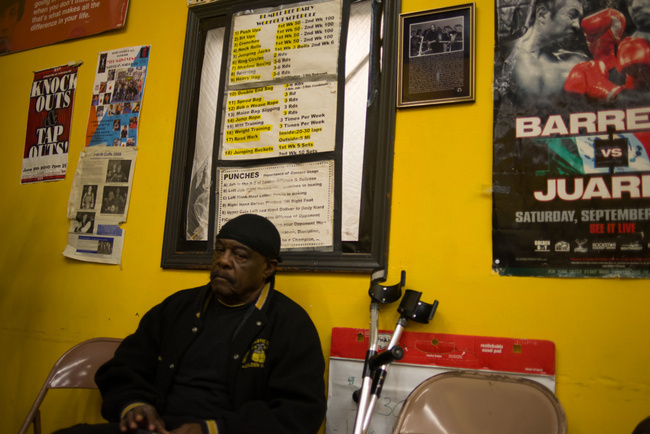 There are a lot of stories that run through boxing gyms. Some of them are of triumphant victories, the others of heartbreaking failure. I guess the measure of a good gym depends on the numbers in that ratio, but with that being the case, Bumblebee ranks highly. “Making champions in life” is a motto that’s gets passed around to inquirers from the outside and seeing how academic performance and in-home behavior plays a significant role in the training, the club stays true to that saying. Plenty of former members have gone onto prestigious careers outside of the sport thanks to lessons they received while inside of it, and I’d say that the vast majority that have come in contact with the club have found a better life for themselves than when they first entered. 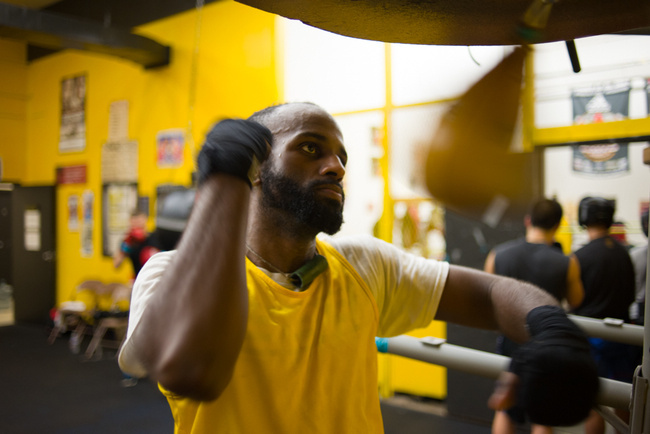 “Boxing, or being part of Bumblebee’s in general, is a period that has changed my life. It feels good. It makes me feel right. There’s no other way to describe it. I feel right,” says Robel Biru, another one of the more dedicated charges that has spent a good half-decade training at the gym. Fighter Robel Biru using the speed bag to finish his workout. With a late start in the sport and a seemingly established career path, Biru has no real aspirations towards becoming a full-time fighter, though the prospects of fighting at least one pro fight is in his vision. 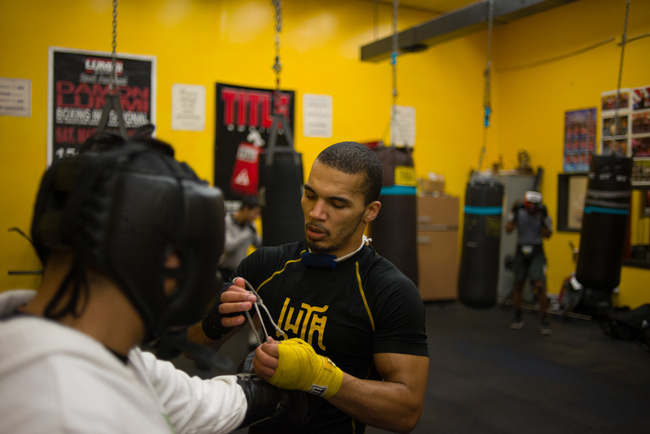 Outside of the sport, the 30-year old works as a lab technician for the water district of the city and attributes his involvement in boxing as one of the main catalysts to advancing his professional career and personal life. Front entrance to the Bumblebee Boxing Club. There is evidence of it all around the gym. Etched onto the fighters’ eyes is a look of a sincere determination, like they were training for something greater that lied beyond the gym walls. While each person shows up for their own reason, everyone seems to understand this common sentiment by helping carry the other one through, whether that’s correcting the stance on a left jab or squirting water into a teammate’s mouth in between rounds. It is the bonds and the community that make the gym a home beyond a mere structure. In the end, this collaborative pursuit of improvement is what stops the walls from crashing down upon one another, keeping everyone steady on their path. Sometimes, there is simply a need for a hand to guide us through, and for some, boxing is that hand. It is to tell us that we are not alone.